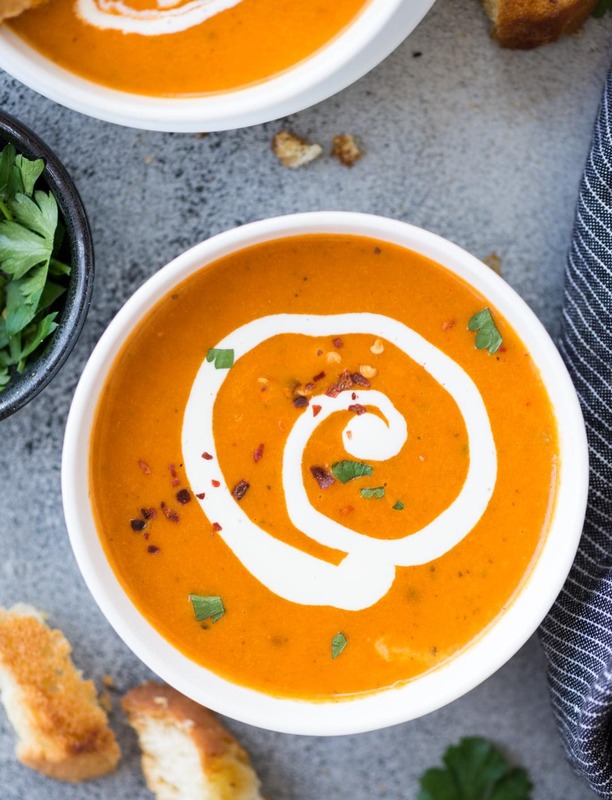 Thick and Creamy Tomato Bisque with a hint of tartness from the tomatoes, is the perfect soup for cold winter days. It is healthy, gluten-free and easy to make. Serve this with a big slice of crusty garlic cheese toast or grilled cheese. After sharing so many soup recipes, finally sharing the most classic and best ever soup recipe today. 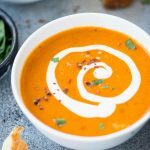 I can say Creamy Tomato Bisque is a close cousin of Tomato Soup, with more rich, smooth and velvety texture. You can make Tomato Bisque from scratch using fresh tomatoes or use canned tomatoes. Either way, it is delicious. Before you get overwhelmed with the name Bisque, let’s talk about Tomato Bisque vs Tomato Soup. 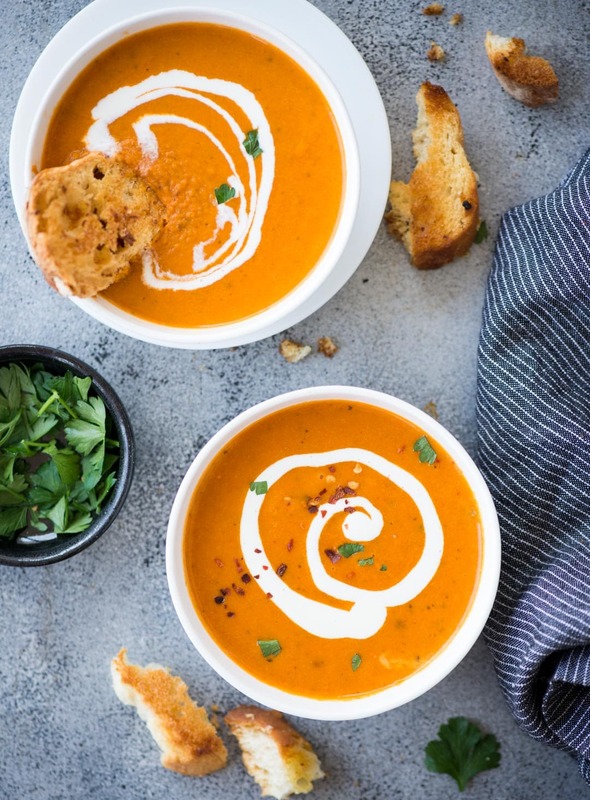 What’s the difference between Tomato Bisque and Tomato Soup? 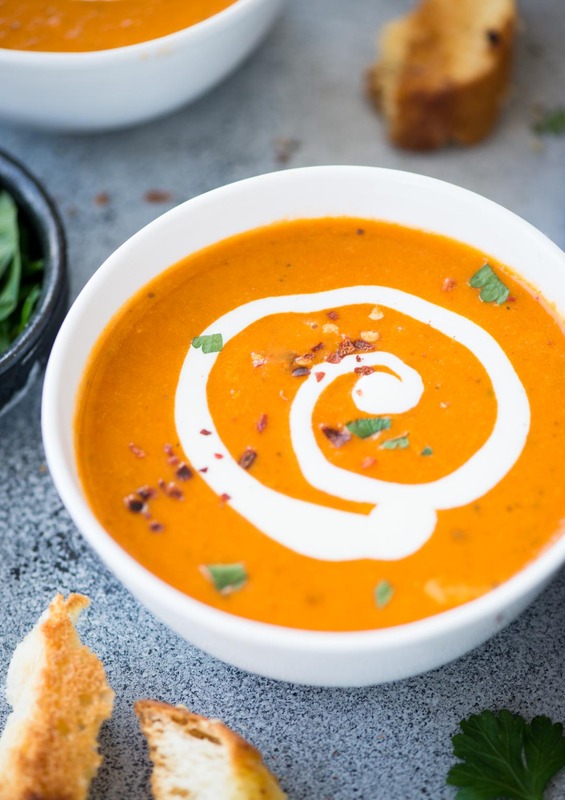 Though the term bisque is liberally used for any creamy, thick soup nowadays, originally Bisque is a French style soup made from shellfish stock and the meat is blended until it is smooth to give the soup a creamy velvety texture. I am sure you might have come across terms like Lobster bisque, shrimp bisque or crab bisque. But don’t worry, this Tomato bisque is absolutely vegetarian. It’s is rich, super creamy and so satisfying. Fresh or Canned Tomatoes, which is better? I have tried both and there is barely any difference. If you have good quality ripe, plum fresh tomatoes, then you can use them. Canned tomatoes from a good brand can also be used to quicken the process. While making Tomato Bisque with Fresh Tomatoes, first prepare the tomatoes. You can blanch them in hot boiling water for 1-2 minutes, then add the blanched tomatoes to ice bath. Once cold enough to touch, peel and remove as many seeds as possible. Another way of prepping the tomatoes, that I prefer is using the microwave. Make 3-4 not so deep long vertical cuts in tomatoes. Place tomatoes in a microwave safe glass bowl and microwave for 5 minutes. Let it rest for a couple of minutes. By now the peels would have loosened by itself. You can easily separate the peels now. If using Fresh tomatoes, you can also oven roast seasoned tomatoes before adding to the soup. Roasted Tomato Bisque has more depth of flavour. 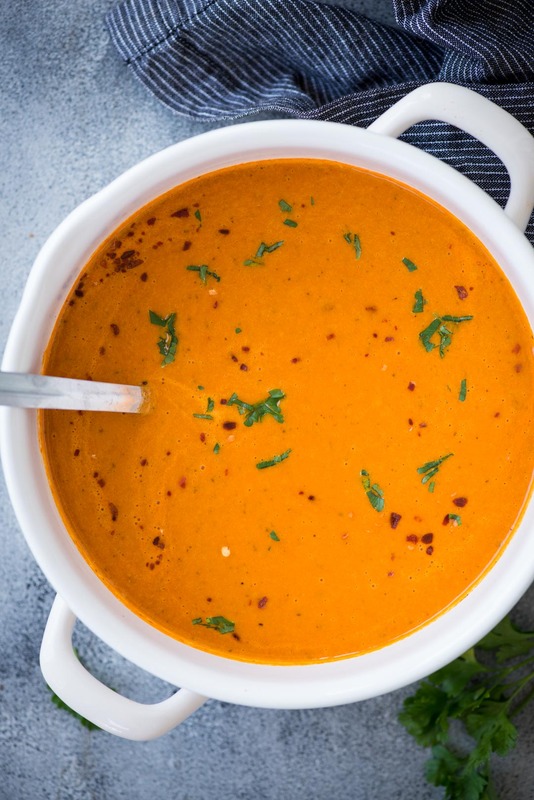 Tomato Bisque is naturally gluten-free. There is no flour to thicken the soup. I have used carrot, which gives the body to the soup and makes it creamy. Then there is cream to give the soup silky smooth texture. Made with natural ingredients from scratch, this soup is very healthy. 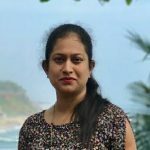 You can adjust the quantity of cream or butter used as per your nutritional requirements. Another best thing about this recipe is, this can easily be converted to vegan. Substitute butter with Olive oil and cream with coconut milk or cashew cream for Vegan Tomato Bisque. Tomato Bisque can easily be frozen. If you are planning to make a big batch and freeze it then don’t add the cream at the end. Portion the soup and freeze them in food-safe freezer bags. Before serving, let it thaw completely. Heat it and add the cream. Melt butter in a heavy bottom pan. Add chopped Chopped Onion, Minced Garlic and Chopped Carrot to it. Saute until the raw smell is gone. About 1-2 minutes. Add Crushed Tomatoes, Chicken Stock, Cayenne, Basil, Oregano, salt and pepper. Mix well. Cover and Let it come to a boil. After 6-7 minutes, take the pan off the flame. Using an immersion blender blend until it is really smooth. Top with more cream while serving. Serve with crusty garlic bread or grilled cheese. If you are using fresh tomato instead, then take 10-12 large tomatoes (roughly 800 grams - 900 grams). Blanch them and discard the seeds. Amount of sugar and seasoning depends on how tart the tomatoes are. If they are more tart, increase the amount of sugar to your taste. Substitute butter with Olive oil and cream with coconut milk or cashew cream for Vegan Tomato Bisque. I was looking for a vegetarian tomato bisque recipe but this is not one, even though the description states that it is. Chicken stock is NOT a vegetarian ingredient. You can easily substitute chicken stock with vegetable stock. I have uploaded the recipe as well.